This isn’t really a review per se, I just wanted to share that I’ve watched it after being told how much of an amazing movie it is by two individuals. Callum, Ceri, you should be proud. If you don’t know what this film is about, it’s essentially a reverse look on horror films – from what I gathered – it’s looking at it from the bad guy’s point of view and suggesting that maybe they’re not bad guys, maybe they’ve just been pushed into a sticky situation and they’re actually really adorable guys. Also, Tucker is Steve the Pirate from Dodgeball, so y’know. It’s hilarious. And violent. Actually, it’s extremely gruesome in parts, but it’s all in good humour…if that makes any sense. You know when it’s funny in films like Scary Movie? It’s like that. But better. Lots better. 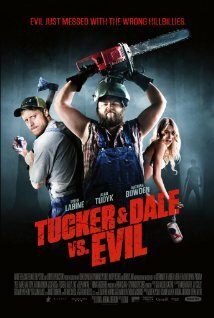 It’s kind of emotional as well, you really feel for Tucker and Dale, they’re so cute! All they wanted to do was go on a vacation and build up their vacation cabin and go fishing and eat bacon and eggs, but nooo because college kids happened. Usually these types of films are about college kids, the typical storyline being that they’re on a road trip (ROAD TRIP WOO!) and they end up in a really secluded forest and then murder by hill-billies ensues. Usually. This film is exactly the same, but it’s the college kids that turn out to be the crazies instead.